Zofia Posmysz spent two years as a prisoner in Auschwitz—and she’s still alive and standing pretty tall, in New York for the Lincoln Center Festival, God bless her. She made a radio-play out of her experiences, The Passenger in Cabin 45, produced in Poland in 1959, though the national atmosphere was hardly sympathetic to such a tale. For one thing, Posmysz, in a brilliant artistic choice, did not tell the story from her own point of view but imagined it through the mind of the SS officer who tormented her. The play’s producer, filmmaker Andrzej Munk, in his turn, began to film the story but was killed in a car crash in 1963. The fragmentary film, a jagged expressionistic masterpiece, superbly staged and acted, feels more real than it might if some neat closure had been devised for the story. Lincoln Center Festival showed the film in the Kaplan Penthouse last Tuesday, two days before the first of three performances of the opera, The Passenger, at the Park Avenue Armory, and I am grateful for the opportunity to have seen the film as well. Mieczyslaw Weinberg, a Polish Jew, fled to the Soviet Union at the Nazi attack in 1939. His family didn’t make it. There is survivor guilt all over this project. Posmysz, Weinberg and librettist Alexander Medvedev do Liese the honor of allowing her an uneasy conscience. The story is told in flashback by a most unreliable narrator: Liese, the wife of a German diplomat, Walter, posted to Brazil around 1960. On the voyage out, she sees—or thinks she sees—Marta, a woman she knew, protected, tormented, sent to her death, when she, Liese, was an officer in Auschwitz. Incredibly, she has never told her husband of fifteen years about her SS past; incredibly, he has never wondered. (And where was he during the war, eh?) Never mind: That’s the set-up. Is the strange, veiled woman on shipboard Marta? Impossible—Marta was killed. Or was she? She never threatens Liese, but Liese is terrified just the same. Walter demands that she explains. She explains, all right—but is she telling the truth? 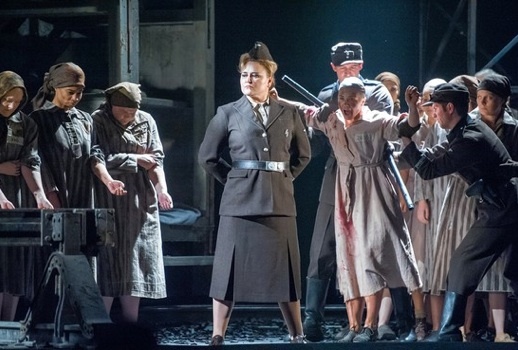 In the Houston Grand Opera production at the Armory, the luxurious liner occupies upper stories of Johan Engels’ spectacular set; the lower levels depicting Auschwitz with its shoddy barracks and sinister train tracks. Liese must move up and down, between heaven and hell, as she explains, describes, lies about her past. We see her curious half-cruel, half-flirtatious relationship with Marta, her favorite prisoner. “I never beat anyone. They knew I wouldn’t do that. They liked me,” Liese explains. But at another point, she cries out, “These people know how to hate!” We see the women in the barracks, and hear their suffering, their hymn of no forgiveness. Liese feels unappreciated. But how can she see that or hear? Did she spy on their miserable existence? Or is she inventing this, too, persecuted not by Marta but by her own long-repressed conscience? The plot is full of holes; impossible to say how far the ambiguities are intentional. Posmysz and Weinberg ponder how anyone could do what was done in the camps, not just German camps, all the camps. They haven’t found easy answers and they do not try to convince us easy answers exist. Weinberg was a friend and protégé of Shostakovich, like him frequently in disfavor with Soviet authorities, who quashed the scheduled Bolshoi premiere of his opera in 1968. It was not performed until 2006, long after Weinberg’s death. He composed 22 symphonies, 17 string quartets and any number of other works (many available on youtube) in a moody idiom, unmistakably Central European, twentieth century, often harsh on the ear but never academically atonal. His wit in setting jazzy themes to the languor of Liese and Walter on their ocean liner, the lurching waltz of the Camp Commander and so on remind one of Shostakovich in similar moods, such as the wedding and its aftermath in Lady Macbeth of Mtsensk. Melody is not eliminated from Weinberg’s score, but as in Shostakovich’s operas, it is used satirically: Moody jazz inflections and soulful saxophones present the languid luxury of the cruise ship to Brazilian paradise; a vulgar waltz is the camp commander’s favorite tune, demanded of the imprisoned violinist, Tadeusz, Marta’s lover, who plays a Bach chaconne instead. That gets him killed, but the orchestra varies rapturously on the material. Singing melody, however, Weinberg implies (as Shostakovich does in The Nose), is for phonies. German officers barely sing at all, and the other characters murmur or declaim in arioso. There is little sensual pleasure here—would it suit the situation? Does it suit modern life? The Armory is an enormous space, and the producers of opera there (both The Passenger and the last opera I heard here, Die Soldaten) feel obligated to amplify voices. This is undetectable at first—the voices are clear, the words comprehensible over the unamplified orchestra (kept to the right of the playing area, as if down an alley, happily visible from my side of the audience). In time, though, especially during the lengthy scenes for several female voices in the barracks scenes of Act II, one notices the blandly equal weight of each voice, the lack of distinction in quality or the emotion in their singing. This undercuts their individuality and therefore their humanity. The vocal appeal of this performance is therefore limited. The direction by David Pountney (who also prepared the English translation—an opera translation that was not painful to listen to! O wonder!) and the superb musical direction by Patrick Summers come from the Houston Grand Opera. A friend remarked, “Of course there’s more interest in New York; there are more Jews here.” In fact, friends in Houston assure me, The Passenger was a big hit and there was no amplification. Extraordinary performances came from Michelle Breedt as Liese and Melody Moore as Marta. Since we were a bit far away for the intense close-ups of Munk’s movie, vocal lines had to serve to convey opaque, hidden, deceptive emotions; some of Liese’s lines seemed to call for more irony than Breedt could give them when electronically mediated, but her outbursts in response to the prisoners’ “ingratitude,” her recollection of the camp’s atmosphere of fear, her nervous dependency on her husband created a fully rounded portrait of this guilt-ridden woman. Joseph Kaiser was more than a cipher as Walter, a character who has not been given an inner life. James Maddalena, veteran of so many Peter Sellars stagings, was amiably sleazy as the ship’s steward. Morgan Smith performed Marta’s fiancé Tadeusz with the proper heroics. Among the women in the barracks, Victoria Livengood contributed a splendid mad old woman, vindictive and brazen. Kelly Kaduce had the curious role of a Russian prisoner, devised (I’m guessing) to appeal to the censors of the Brezhnev Era: She nobly defies torture, brings news that the Red Army has recaptured Kiev and, in the only a cappella moment of the score, sings a “Russian folk song.” This event, the only time in the opera that traditional melody is used unironically, is guaranteed to stand out, but if Weinberg hoped it would win the censors over, his hopes were disappointed. Kaduce sings beautifully but in a rather standard way: The tune should sob with Slavic melancholy like Polina’s song in Queen of Spades or Lyubasha’s aria in Tsar’s Bride. Kaduce may be too American for that.